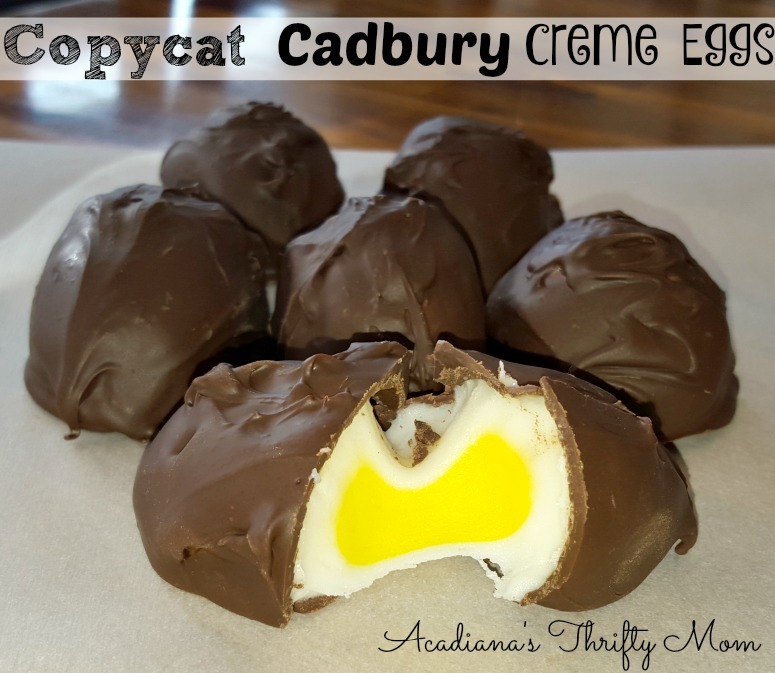 Copycat Cadbury Creme Eggs are a great way to celebrate this Easter. 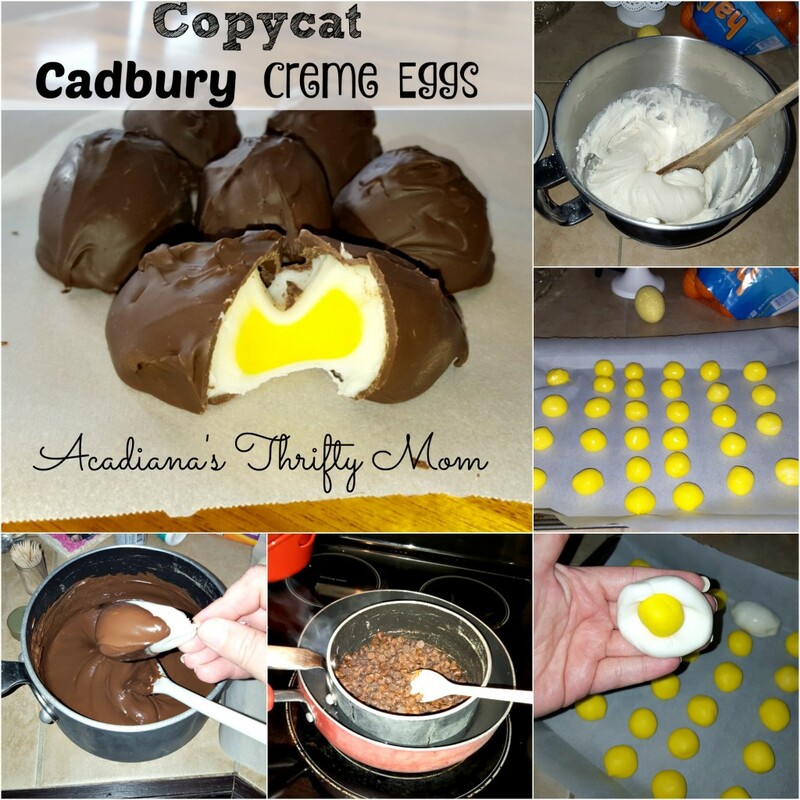 If you like Cadbury Cream Eggs, you are going to LOVE these! I decided to mix it up a little bit and experiment with some candy. I was looking around for a recipe that was similar to the Cadbury Cream Eggs we love around our house so we could enjoy them year ’round. Well, I certainly found it! I found more than ten different recipes and they were all almost identical! Candy is often an exact science since just a teaspoon of sugar or oil can change the perfect recipe into a disaster! I decided to follow all of the recipes combined to a ‘T’ and these came out beautifully! They were also so much easier than I expected. Now, with that being said, they do take some time to set and “liquify” if you choose to use the invertase. These Cadbury Creme Eggs will taste and look just as fantastic if you choose to leave the invertase out though 🙂 The invertase just makes the centers a little more creamy. Cream the butter and corn syrup together in mixer. Add the vanilla and mix until well blended. After the butter and corn syrup are creamy (you can add the invertase now if you are going to use it), start adding the powdered sugar 1/2 cup at a time. The mixture will become thick. Mix until well blended. Scoop out about 1/3 of mixture into a separate bowl and mix yellow food coloring into it until it is a nice bright yellow. I used gel food coloring for this. Place both bowls of mixture into the refrigerator for about 45 minutes to an hour. Remove yellow mixture and form into 10-1 inch balls and place on parchment paper. Place these in the freezer for about an hour. After an hour, remove the yellow mixture from the freezer and remove the white mixture from the refrigerator. Scoop out white mixture in 1 tablespoon scoops and press into a flat circle. Place the yellow “yolk” into the center of the white circle and wrap around. Form into an “egg”shape and place onto parchment paper. After all of the “yolks” are covered, place them into the freezer for about an hour. 10 minutes before removing the “eggs” from the freezer melt the chocolate with shortening. I melted mine by placing the chocolate chips into a non-stick pan inside of another pan filled halfway with water on medium-high heat. It will take about 5-10 minutes for the chocolate to melt. Be sure to stir continuously. Once the chocolate is melted, carefully dip each “egg” into the melted chocolate and allow to set on a clean sheet of parchment paper. Allow the chocolate to “set” for at least an hour in the refrigerator. If you are using invertase, allow 24 hours for the centers to become “creamy”. Allow candy to warm up to room temperature before serving. 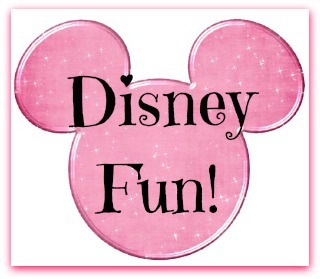 Are you looking for more great Easter treats to share with your family? Try this fun and simple Easter Bunny cake and let me know what you think.